Roxanne Dunbar-Ortiz grew up in rural Oklahoma, the daughter of a tenant farmer and part-Indian mother. She has been active in the international Indigenous movement for more than four decades and is known for her lifelong commitment to national and international social justice issues. After receiving her PhD in history at the University of California at Los Angeles, she taught in the newly established Native American Studies Program at California State University, Hayward, and helped found the Departments of Ethnic Studies and Women’s Studies. Her 1977 book The Great Sioux Nation was the fundamental document at the first international conference on Indigenous peoples of the Americas, held at the United Nations’ headquarters in Geneva. Dunbar-Ortiz is the author or editor of eight books, including Roots of Resistance: A History of Land Tenure in New Mexico and An Indigenous Peoples’ History of the United States (Beacon Press, 2014) was the 2015 Recipient of the American Book Award and the winner of the 2015 PEN Oakland-Josephine Miles Award for Excellence in Literature. Dina Gilio-Whitaker (Colville Confederated Tribes) is an award-winning journalist and columnist at Indian Country Today Media Network. A writer and researcher in Indigenous studies, she is currently a research associate and associate scholar at the Center for World Indigenous Studies. 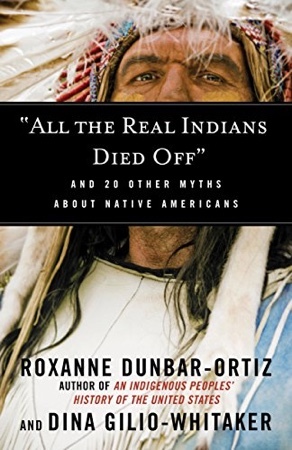 Excerpted from “All the Real Indians Died Off” And 20 Other Myths About Native Americans by Roxanne Dunbar-Ortiz and Dina Gilio-Whitaker (Beacon Press, 2016). Reprinted with permission from Beacon Press. The myth of benevolent, fair-minded presidents derives from denial of the policy of genocide upon which the founding of the United States was based. After a decade of war, the British conceded independence to the colonists. In the 1783 Treaty of Paris, they transferred ownership of all British territory south of the Great Lakes, from the Mississippi to the Atlantic, and north of Spanish-occupied Florida, a much larger area than the thirteen colonies. However, before the promulgation of the Constitution in 1787 and subsequent election of the first president, the elite of the thirteen insurgent British colonies issued a genocidal policy in the Northwest Ordinance. This was the first law of the incipient republic, revealing the motive for those desiring independence. It was the blueprint for occupying and driving out the substantial agricultural societies of the formerly British-protected Indian Territory (“Ohio Country”) on the other side of the Appalachians and Alleghenies. Britain had made settlement there illegal with its Proclamation of 1763. The Northwest Ordinance was a policy document based on the Land Ordinance of 1785 that had established a national system for surveying and marketing plots of land, and as historian Woody Holton has noted, “Under the May 1785 ordinance, Indian land would be auctioned off to the highest bidder.” The Northwest Ordinance, albeit containing rhetoric about guaranteeing Native occupancy and title, set forth an evolutionary colonization procedure for annexation via military occupation, territorial status, and finally statehood, with the Pacific Ocean as the final western boundary. Conditions for statehood would be achieved when the settlers outnumbered the Indigenous population, which required decimation or forced removal of Indigenous populations. In this US system, unique among colonial powers, land became the most important exchange commodity for the accumulation of capital and building of the national treasury. To understand the genocidal policy of the US government, the centrality of land sales in building the economic base of US wealth and power must be seen. A new element was added to the independent Anglo- American legal regime: treaty-making. The US Constitution specifically refers to Indigenous nations only once, but significantly, in Article 1, Section 8: “[Congress shall have power] to regulate Commerce with foreign Nations and among the several States, and with the Indian Tribes.” In the federal system, in which all powers not specifically reserved for the federal government go to the states, relations with Indigenous nations are unequivocally a federal matter. Although not mentioned specifically, Native peoples are implied in the Second Amendment. Male settlers had been required in the colonies to serve in militias during their lifetimes for the purpose of raiding and razing Indigenous communities, and later states’ militias were used as “slave patrols.” The Second Amendment, ratified in 1791, enshrined these irregular forces into law: “A well regulated Militia, being necessary to the security of a free State, the right of the people to keep and bear Arms, shall not be infringed.” The continuing significance of that “freedom” specified in the Bill of Rights reveals the settler-colonialist cultural roots of the United States that appear even in the present as a sacred right. US genocidal wars against Indigenous nations continued unabated in the 1790s and were woven into the very fabric of the new nation-state, continuing across the continent for the next hundred years. The fears, aspirations, and greed of Anglo-American land speculators and settlers on the borders of Indigenous territories perpetuated this warfare and influenced the formation of the US Army, much as the demands and actions of backcountry settlers had shaped the colonial militias in North America. Brutal counterinsurgency warfare would be the key to the army’s destruction of the Indigenous peoples’ civilizations in the Ohio Country and the rest of what was then called the Northwest over the first two decades of US independence. In 1803, the Jefferson administration, without consulting any affected Indigenous nation, purchased the French-claimed Louisiana Territory (formerly Spanish) from Napoleon Bonaparte. This territory comprised 828,000 square miles, and its addition doubled the size of the United States. The territory encompassed all or part of multiple Indigenous nations, including the Sioux, Cheyenne, Arapaho, Crow, Pawnee, Osage, and Comanche nations, among other peoples of the bison. It also included the area that would soon be designated Indian Territory (Oklahoma), the future site of the forced relocation of Indigenous peoples from east of the Mississippi. Fifteen future states would emerge from the taking: all of present-day Arkansas, Missouri, Iowa, Oklahoma, Kansas, and Nebraska; the part of Minnesota west of the Mississippi; most of North and South Dakota; northeastern New Mexico and North Texas; the portions of Montana, Wyoming, and Colorado east of the Continental Divide; and Louisiana west of the Mississippi River, including New Orleans. Except for the city of New Orleans, the lands had not yet been subjected to settler-colonialism. The territory pressed against lands occupied by Spain, including Texas and all the territory west of the Continental Divide to the Pacific Ocean. These would soon be next on the US annexation list. Wealthy plantation operators in Virginia and the Carolinas were usurping Cherokee- and Muskogee-developed farmlands in what became Georgia and were intent on establishing themselves in the Mississippi Valley. Neither superior technology nor an overwhelming number of settlers made up the mainspring of the birth and development of the United States. Rather, the chief cause was the colonialist settler-state’s willingness to eliminate whole civilizations of people in order to possess their land. The avatar for the ethnic cleansing of that vast territory in what is now the US South was Andrew Jackson, the seventh president, serving from 1829 to 1837. He began the project in 1801, initiating his Indian-killing military career as head of the Tennessee militia. As the most notorious land speculator in western Tennessee, Jackson had enriched himself by acquiring a portion of the Chickasaw Nation’s land. After his militia’s brutal wars of annihilation against the Choctaws and Creeks (Muskogees), Jackson continued building his national military and political career by tackling the resistant Seminole Nation in what was then Spanish-occupied Florida, with successive presidents Jefferson and Madison turning a blind eye. For his bloody and illegal deeds (invading a foreign European country), President James Monroe made Jackson the military governor of Florida and a general in the US Army, beginning what are known as the three Seminole Wars. In 1836, during the second of these wars, US Army general Thomas S. Jesup captured the popular Anglo attitude toward the Seminoles: “The country can be rid of them only by exterminating them.” By then Jackson was finishing his second term as one of the most popular presidents in US history to that date. The fledgling United States government’s method of dealing with native people—a process that then included systematic genocide, property theft, and total subjugation—reached its nadir in 1830 under the federal policy of President Andrew Jackson. More than any other president, he used forcible removal to expel the eastern tribes from their land. From the very birth of the nation, the United States government truly had carried out a vigorous operation of extermination and removal. Decades before Jackson took office, during the administration of Thomas Jefferson, it was already cruelly apparent to many Native American leaders that any hope for tribal autonomy was cursed. So were any thoughts of peaceful coexistence with white citizens. The Southern slave owner elite that controlled the presidency for nearly all of the first half-century of the United States succeeded in instrumentalizing the removal of all Native nations east of the Mississippi. With the cotton baronies free of Indigenous inhabitants, the seat of political power moved north with the expansion of slavery into the territories being a growing division between north and south, leading to the bloody Civil War. But the administration of Abraham Lincoln continued the policy of Indian destruction under the banner of “free soil.” Lincoln’s campaign for the presidency had appealed to the vote of land-poor settlers who demanded that the government “open” Indigenous lands west of the Mississippi. They were called “free-soilers,” in reference to cheap land free of slavery. In Minnesota, which had become a non-slavery state in 1859, the Dakota people were on the verge of starvation by 1862. When they mounted an uprising to drive out the mostly German and Scandinavian settlers, Union army troops crushed the revolt, slaughtering Dakota civilians and rounding up several hundred men. Three hundred prisoners were sentenced to death, but upon Lincoln’s orders to reduce the numbers, thirty-eight were selected at random to die in the largest mass hanging in US history. In the midst of war, Lincoln did not forget his free-soiler settler constituency that had raised him to the presidency. During the Civil War, with the Southern states unrepresented, Congress at Lincoln’s behest passed the Homestead Act in 1862, as well as the Morrill Act, the latter transferring large tracts of Indigenous land to the states to establish land grant universities. The Pacific Railroad Act provided private companies with nearly two hundred million acres of Indigenous land. With these land grabs, the US government broke multiple treaties with Indigenous nations. Most of the Western territories, including Colorado, North and South Dakota, Montana, Washington, Idaho, Wyoming, Utah, New Mexico, and Arizona, were delayed in achieving statehood because Indigenous nations resisted appropriation of their lands and outnumbered settlers. So the colonization plan for the West established during the Civil War was carried out over the following three decades of war and land grabs. Under the Homestead Act, 1.5 million homesteads were granted to settlers west of the Mississippi, comprising nearly three hundred million acres (a half-million square miles) taken from the Indigenous collective estates and privatized for the market. This dispersal of landless settler populations from east of the Mississippi served as an “escape valve,” lessening the likelihood of class conflict as the Industrial Revolution accelerated the use of cheap immigrant labor. Up until the 1849 establishment of the Department of Interior, “Indian affairs” fell under the Department of War (renamed Department of Defense in 1947). The Constitution established the president of the United States as commander in chief of the armed forces. So over the first seven decades of the United States, making war and expanding from the original thirteen states across the continent to the Pacific, US presidents’ relationship with Indigenous nations was war. War on Native nations did not end with the transfer to Interior but rather continued for four decades, and the genocidal policy of elimination of the Native nations, as nations, is clear. Since 1977, Native organizations and governments have been building institutional infrastructure and international human rights law within the United Nations. In 2007 this work produced the long-negotiated UN Declaration on the Rights of Indigenous Peoples, which calls for self-determination and a full range of specific and general human rights. There is a UN Special Rapporteur on Indigenous Peoples who monitors and reports on Indigenous complaints and government action in relation to the declaration. This has moved much Native American policy work from the Interior Department to the State Department and has led Native Americans to feel some optimism about future nation-building efforts.